Fairy Godmother Desiderata has died without doing any estate planning – leaving Princess Emberella at the mercy of the not so good and wise Godmother Lilith. Lilith is dead set on having a happy ending no matter what and she’ll stop anyone who tries to get in her way. Now a trio of witches from a neighboring land, Magrat Garlick, Granny Weatherwax, and Nanny Ogg, must travel via broomstick to Genua and make sure that the age-old story of servant girl and prince ends differently this time. During the journey the witches face vampires, werewolves and even falling houses before they can battle it out with a power mad woman who is eerily familiar to one of their own. Sissy: This book is not for people who take themselves too seriously. Terry Pratchett is a wickedly funny satirist and overly stuffed shirts might find him silly. But as I told my friend the other day, if you don’t take time for silliness in your life, your soul becomes constipated. Bubby: Ooo, which friend? Can I guess? Never mind, I’ll be nice. 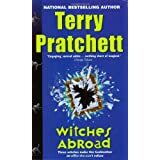 Sissy: In Witches Abroad, Pratchett revisits many familiar fairy tales. He teaches us about sensible magic and manages to crack me up on every page. Even the character names are hilarious. I tried to read funny bits out loud to my 17-year-old son today and he just looked at me like I was a blooming idiot. Bubby: Yes! That’s the same reaction I get from my husband. I own almost everything Terry Pratchett has written and I often find his books so hooting funny that I laugh out loud. I try to share the funniness with my family but they are too closed-minded to appreciate dry British humor. That’s the disclaimer with these books. It seems that a reader will either find them side-splitting or just a pain in the side. There doesn’t seem to be much middle ground. If you appreciate old BBC television shows like “Fawlty Towers” or “Keeping Up Appearances” then you will enjoy Terry Pratchett. If not, well, just move on to the next review. Sissy: Reading this book kind of reminded me of watching the movie Waking Ned Devine. And if you don’t like that movie, then skip this book and read Tolstoy. Or something from Oprah’s book list. The three witches, Nanny Ogg, Magrat Garlick and Granny Weatherwax (see, can you even say that without giggling?) have great adventures amongst the “furriners” on their travels to the city of Genua. Bubby: And Greebo, the salacious cat who is deadlier than a troop of Green Berets – can’t forget him. Bubby: We don’t usually use quotes straight from the book but Pratchett’s writing is too good. One of my favorite things is Pratchett’s footnote explanations. For instance, he will mention “Bear Mountain”, which should have been called “Bare Mountain” (no trees, you see) and then put an asterisk at the end of the paragraph which links to a footnote on bad spelling, explaining all about when a badly educated deity cursed the seraph of Al-Yabi and how he was cursed to turn everything into Glod, who was a small dwarf from some mountain community thousands of miles away (instead of gold, you see) and now all the people in Al-Yabi are short and bad-tempered and it’s just so dang funny and, well, I can’t do it justice. Just go read the book already. I own it. You can borrow it. Sissy: Unrestrained frivolity. Monty Python (but more literate and less crude) meets The Brothers Grimm meets Sabrina the Teenage Witch. Ha! Which brings me to my next point – why do we like books with magic and witches? Bubby: We? As in us, sisters Bubby and Sissy? Or as in we, the human populace at large? Or we, imperially speaking, meaning you? Sissy: What a frothing waste of words, Bubby. We (you and me, the Bubble Bath Bloggers) are not pagans who routinely light black candles and dance naked around the firepit. Sissy: Shut up. I’m not done. We like books with magic and witches because they are good imaginative fiction. I don’t believe in magic because I believe that magic is simply science that I don’t yet understand. So all you uptight Harry Potter-book-burning, rioting peasants relax. We are not a coven. Bubby: Because there’s only 2 of us and you need 3 for a proper coven, everyone knows that. No, seriously. No witchcraft practicing going on here. Sissy: Okay. Now, back on topic. Read the witchy magic book. It’s good. 4 bubbles. Bubby: Yep. Delightful. Be aware that not all Terry Pratchett books are created equally – if you’d like a list of which ones to read in which order, leave a comment or shoot us an email and I, Bubby, will share my knowledge. 4 1/2 bubbles. I need to know which ones to read, and in which order. Please, please share!